The transatlantic dogfight over multinationals’ profit-shifting continues to heat up. US OFFICIALS HAVE fired a broadside against their European counterparts ahead of an impending ruling about Apple’s tax affairs in Ireland. In a white paper, the US Treasury said European Commission probing into claimed sweetheart deals EU countries gave firms like Apple, Amazon and Starbucks “undermines the international tax system”. It also accused the commission of acting as a “supra-national tax authority” that was overstepping its powers by challenging individual member states’ tax policies. The US authority restated its view that the investigations were “disproportionately” targeting US companies, and that the commission’s work would undermine its own task in recovering taxes from firms’ offshore earnings. “These investigations have major implications for the United States. In particular, recoveries imposed by the commission would have an out-sized impact on US companies,” US Treasury official Robert Stack in a statement. “US taxpayers could wind up eventually footing the bill” if the commission forces the companies into tax settlements, he said. However the commission denied in a statement yesterday that it was particularly targeting US companies, while reiterating that any tax breaks in EU countries that favoured some firms over others could be ruled illegal – and have to be repaid. The commission has already delivered a preliminary finding that Ireland provided the iPhone maker with an unfair advantage in return for the firm providing jobs in the country. Apple employs an estimated 5,000-plus people in the Republic, and a final ruling on the case is expected to be delivered next month. Much of the transatlantic tug-of-war between the US and EU administration is centred on differing views over where multinationals should pay their taxes – in their home country, where firms’ intellectual property is usually developed, or in the territories where sales are made and the companies often have significant operations. In the US, firms are only taxed on overseas income when the funds are brought into the country, providing companies with an incentive to instead find ways to stockpile their cash in low- or no-tax jurisdictions offshore. It has been estimated the 50 largest US companies have a combined $1.4 trillion stashed offshore, with Apple alone accounting for more than $180 billion in those funds. The company’s CEO, Tim Cook, previously said he would “love to” repatriate the cash – but that wasn’t possible because it would “cost me 40%”, an apparent reference to the combined effects of US federal and state taxes. Meanwhile, the Irish government has previously said it will fight any finding that it gave a preferential tax deal to Apple, despite that outcome potentially leading to a windfall payout from the technology giant. Apple has flagged the “material” impact such a ruling could have on its balance sheet, including back-taxes for a period covering up to a decade, although in filings from April last year the company added it was unable to estimate the exact fallout. Estimates of how much Apple could be forced to pay if it gets hit with a negative finding have ranged widely, with analysts at JPMorgan estimating that in the worst-case scenario for the tech company the figure would be $19 billion (€16.8 billion at today’s rates). However the figure has previously been put as low as $200 million. The European Commission probe centres on the tax dealings of two Irish-registered Apple offshoots, Apple Sales International (ASI) and Apple Operations Europe, and their handling of so-called ‘transfer pricing’ arrangements. Figures from 2012 showed ASI booked revenues of $63.9 billion, but Irish officials agreed to set its taxable income at between €50 and €60 million as the amount that represented its local operations. The US Senate was told in 2013 that its Irish subsidiaries paid an effective tax rate of around 2%, against the headline rate of 12.5%. 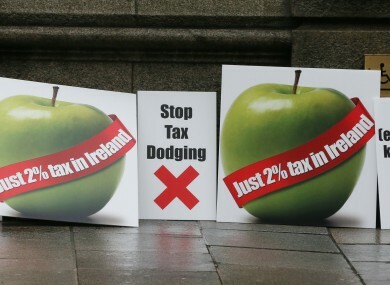 Email “Europe accused of 'undermining the global tax system' as Apple faces billions in Irish back-taxes”. Feedback on “Europe accused of 'undermining the global tax system' as Apple faces billions in Irish back-taxes”.